Encouraging research in cardiology, oncology, and psychiatry. The Mach-Gaensslen Foundation, in partnership with the Royal’s Institute of Mental Health Research, awards an annual prize of $100,000 to an outstanding Canadian researcher or research team working in an area of mental health. First awarded in 2015, the prize supports researchers with a demonstrated track record, scientific excellence, innovative thinking, imagination and originality. The researcher’s ability to work with other disciplines or research teams in other institutions is also considered. 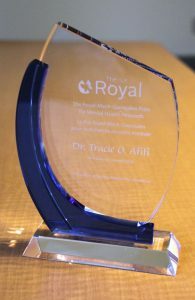 Visit the web site of our partner, the Royal’s Institute of Mental Health Research, for guidelines and application information for the prize.